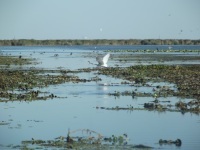 The Danube Delta is the largest continuous marshland in Europe and a critical site for bird conservation. The Delta is on the flyway between central and eastern Europe and the Mediterranean and Middle East and Africa. It is also the major site for two threatened species, the pygmy cormorant and the red-breasted goose. The area consists of a low alluvial plain, mostly covered by wetlands and water. There is an intricate pattern of marshes, channels, streamlets and lakes. 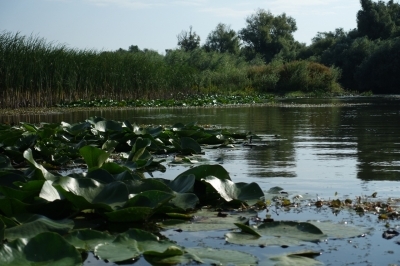 At inscription, IUCN suggested that the site should be extended with the Ukrainian part of the Delta (the Dunay Ramsar site). I explored part of the Delta by boat. It was a standard tour of about 6 hours provided by Hotel Delta in Tulcea. I was in a group of 18, however the ship can hold many more. We navigated mainly to the north, in the area of Lake Lung and Lake Nebunu. On our way we encountered several other tour boats, as well as speed boats and even canoos. Dozens of fishermen dotted the shores. Navigating these canals and streams by boat is a relaxing way to spend a couple of hours. I sat at the front and did my best to spot as many birds as possible. What we saw: White Pelican, Cormorant, Egret, Glossy Ibis, Heron, Kingfisher and many waterfowl. I saw a lot more than I have photos - it's very difficult to come up close because of the noise of the boat. What also catches the eye are the many plastic bottles that have been left in the water and on the shores. This part of the Delta is relatively well accessible from the bigger cities like Tulcea, and probably a lot of locals go fishing and camping here. I expect the part closer to the Black Sea to be more pristine. As a small extension of the 2018 community meetup I joined Philpp on a trip to the Danube Delta. For some reason I had long wanted to visit the place where the Danube, this great European river, meets the sea. We had been on the Danube for two days now. As part of the meetup we slept in Russe (Bulgara) and visited the Roman fortifications (T). From Russe we drove to Srebarna and then to Silistra (T) where our meetup ended. Silistra also marks the end point of the Roman Limes. As mentioned in nearly everyone's review of Srebarna it was kind of a let down. We wanted to see birds and there were none to be spotted. So I was a bit anxious to see if we would spot any birds in the Delta, especially considering how busy with locals, tourists and fishermen the place is; the Delta is not a fully protected area, only parts are. My worries were quickly dissolved as within the hour we had seen a kingfisher and an eagle up close. There were also plenty of pelicans and what not. Under normal circumstances I am not really keen on birds, but this was quite nice as it also combined with some beautiful scenery. Admittedly, the vegetation is what most Europeans will recognize from their own lakes and rivers at home. But this is a great representative for this type of ecosystem. Add to this the size of the site and you have a fine world heritage site. Interestingly, the Delta also is home to a significant Russian minority, the Lipovans. They fled Russian in the 18th century when the Orthodox Church was reformed and they wanted no part of it. As a consequence we stopped in two primarily Russian villages along the way. I am not too fond of these folkloristic visits to be honest and would have rather done without. There are several tour operators offering tours into the Delta. The Delta is large, so I would check their itinerary and the type of boat they transport you on. We went on a small but speedy inflatable boat way deep into the Delta. Personally, I would have loved if we had made it to the Black Sea, but I am not sure such a tour exists. Part of the tour was a stop in a local village for lunch. Both Philipp and I decided against this option, but we were then stuck in a fairly mundane Russian village in the Delta with little else to do. If possible, I would book a tour without extended lunch break and keep on cruising. You can also stay in the Delta overnight. There are hotel boats. And you can also sleep in the traditional villages. Be mindful, though: At night the mosquitos come out. The hub for the Danube Delta is Tulcea. We came by car from Bulgaria crossing the border at Silistra and the Danube by ferry thereafter. It took surprisingly long to get out of Bulgaria into Romania considering both are EU members. In Romania we also needed to figure out how to get a highway pass (all possible online, no printer required). And then it was still a pretty long ride as Tulcea is really off the map for most purposes. The closest WHS is the Southern most Stuve arc. Fellow WHS travellers actually made the effort. But they had to do quite a detour and cross two borders in the process (Moldova, Ukraine), so this took them long hours. Unless you are a world heritage fanatic you should skip on this. To see further sites in Romania you will have to get back to Bucharest first. Alternatively you can head South to Bulgaria which has several sites, but admittedly these are of rather low quality. In our case we drove back to Nessebar (5h including the time spent at the border). We stopped once along the way near Constantiu to visit the rather weird Rupestrian Art of Basarabi (T) in the process. Or at least we tried to, as there really wasn't much to see and do. The Danube Delta lies on the border withh Ukraine so your phone may actually switch to a Ukrainian network. This may result in high roaming costs, so our guides recommended to us to turn off the data connection and go into flight mode. While the weather may be warm, I would recommend bringing warm clothes nonetheless. The boats go fairly fast and are not protected against the wind. I wish I had brought more clothing as I was freezing when the sun descended. Tulcea is fairly dull. Considering that most visitors will have to stay overnight, there is very little in tourist infrastructure available. Finally, if you plan to stay at night bring insect repellant. During a normal day time visit, though, you will not need it. I took an 8-hour, speed boat tour by Safca Delta Tours from Tulcea on May 23. This company seems to be one of the more popular and reputable ones for the tour of the Delta. The skipper made things fun for all 4 of the participants all day. It cost something like 80 Euros including lunch. We left Tulcea at 9:30, had lunch at the village of Mila 23, went on to the village of Letea for what they called a safari and came back on the Tulcea-Salina branch of the Danube straight to Tulcea at 17:30. Hmmm, May is supposed to be one of the better months for the bird-watching there, but I'm not sure if I saw so many birds. Or maybe my expectation was too high: my image was to be surrounded by birds just as I was surrounded by tropical fish at the Great Barrier Reef when I went scuba-diving there. Birds were almost always seen way too far. The just-caught, fresh-water fish lunch (fish soup and deep fried fish) was nice. I'm not sure if the safari was worth it, either. We saw some wild horses sort of bathing in water and a small dune close to the Ukrainian border. It did offer a feeling that it was a far corner of Europe. After my immersion amongst the churches of northern Romania it was a pleasure to get back to nature. 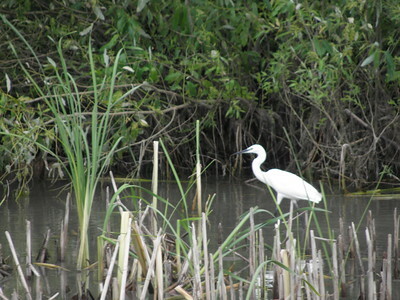 The varied bird life of the Danube Delta provided the necessary respite. I reached Tulcea by bus from the railhead of Braila and straight away embarked on the afternoon ferry down the Sulina Channel. Disembarking at Crisan I found that my guesthouse there had arranged a small boat to take me into the narrow channels of the Delta. Passing through several lakes of the Caraorman district I saw abundant bird life coming home to roost in the late afternoon sunlight. 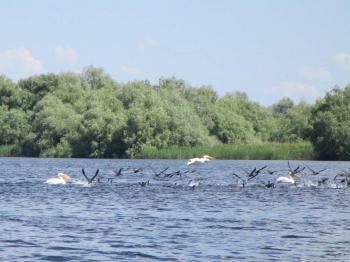 As no-one has yet reviewed the Danube Delta so I will provide a “partial” report! It is the largest river delta in Europe (assuming the Volga is not!) and has suffered relatively little from human interference compared with others such as the Rhone. To get to its heart and experience its full size and remoteness you should probably take a ferry/hydrofoil into the interior where the villages are not accessible by road. There are however some roads extending part way into the Delta which reach villages where you can hire a small boat and these seemed to me to give a reasonable feeling for the countryside and way of life of the people as well as giving access to some of the birdlife for which the Delta is famous and which we had primarily come to see. We concentrated on the southern area around the villages of Agighiol and the “road-head” at Murighiol together with Lake Razelm (all within the inscribed area). You can see one of the main channels nearby with large boats steaming up and down but the glory of the Delta is to be found in the lakes and reed beds and the examples of human and wildlife they support. The villages are full of thatched houses (photo) and exude a rural atmosphere. The horizons are enormous and the birdlife fine even for those who are not birdwatchers! Prison: The AB eval states "Conditions for the workers on state farms (on the newly-created polders) are reported to be extremely bad (attempts to introduce eco-farming in the near future)(IUCN-EEP, 1991); they lack basic infrastructures and the work is unpopular. It is reported that the state farms were used as prison camps"
Oxbow lakes: See the map in the AB eval - Lake Belciug (No 18). And elsewhere in this paper .. "The right side includes oxbows with permanent vegetation, surrounded by the Sulina arm except during periods of high floods"